The HTC One may be going head-to-head with the Galaxy S4 for the Android crown, but in terms of design, the device has frequently been compared with Apple’s iPhone 5. Just like its Cupertino rival, it’s comprised of beautiful aluminum unibody, and the consensus seems to be that the two handsets are the prettiest, on the market. The build quality of the two respective flagships is certainly something to savor, but when it comes to real-world use, how do they fare against the day-to-day trials and tribulations a smartphone may well face? A drop test is always a pretty good measure of a device’s durability, and AndroidAuthority has just videoed a head-to-head between the HTC One and iPhone 5. Find out how each coped with the rigorous test, and more importantly, which emerged victorious, after the break! 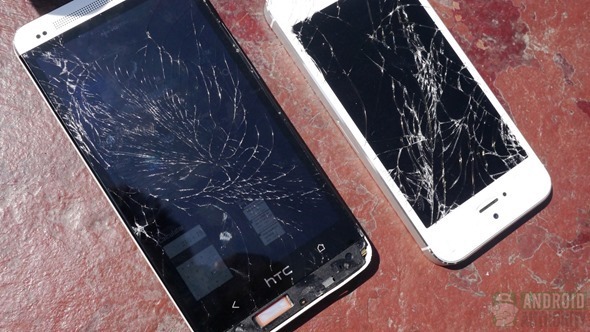 Often with drop tests, there’s a mismatch, with devices having been crafted from differing materials. But the HTC One and iPhone 5 bear striking similarities, which should, on paper, mean both offer similar robustness. Check out the video below to find out what happened. As you can see from the clip, the iPhone 5 took a bit of a hiding from the get-go. The first drop, from waist height, saw Apple’s device hit the deck face-first, which produced the familiar, shattered look. The HTC meanwhile, seemed to land on the corner from the pocket test, and while the screen remained fairly intact, one of the speaker grills completely detached. The second test, from chest height, produced reasonably balanced results. Whereas the iPhone 5 had landed rather unfortunately in the initial test, both devices hit the ground at similar angles, and, although they suffered some scuffing, the aluminum shells kept both in reasonably good shape. On the penultimate, head-height test, the iPhone once again takes a hiding. Hitting the floor face-down, its display goes from mostly smashed to a genuine health and safety hazard. Notably, however, it still works. The HTC landed in a much more favorable position once again, and as well as working, appeared basically unscathed in comparison to its rival. Finally, the over head-height test saw the HTC’s display succumb, but while both devices ended up looking like they’d been battling a war (which, metaphorically at least, I guess they are); the aluminum bodies kept them from suffering any critical damage. Screens aside, they both worked after numerous gravity battles, and it just goes to show that, as well as looking and feeling great, a better build quality equates to a stronger device.